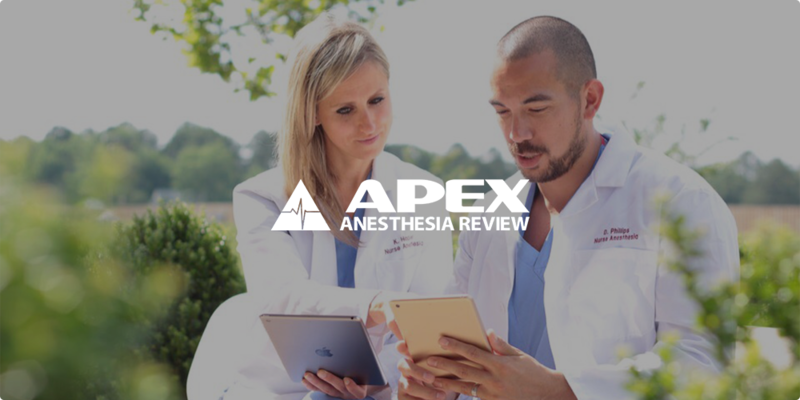 APEX Anesthesia Review provides online courses that help nurse anesthesia students prepare for the National Certification Exam and makes it easy for certified nurse anesthetists (CRNAs) to earn continuing education credits. In this case study, Kevin R. Baker, a nurse anesthetist and co-founder of APEX, shares the story of the project and how their team managed to achieve a high level of success for their customers. There are over 50,000 CRNAs in the US that provide anesthesia services in hospitals, outpatient surgery centers, dental offices, and a variety of other places where patients require anesthesia or pain management. To become a CRNA, you must earn a bachelor’s degree in nursing and have a minimum of one year of critical care experience. Next, you must complete a rigorous training program that awards either a master’s or doctorate degree. Finally, you must pass a National Certification Exam to demonstrate competency. When we launched APEX in 2014, there weren’t any comprehensive online resources that helped students prepare for the National Certification Exam. We saw this gap in the market as the perfect opportunity to serve our population in a new and exciting way. In the past five years, we’ve trained over ten thousand users and have partnered with over 85 graduate programs in the United States and Puerto Rico. As we’ve grown, we’ve developed additional courses that help CRNAs meet the requirements for recertification. As CRNAs ourselves, we understand the wants and needs of our customers, and we have an intrinsic motivation to serve our population. We build each course using best practices in instructional design. We create and iterate in a very systematic way, which helps us deliver an exceptional user experience. We currently train over 10,000 people in the US and Puerto Rico through the APEX website, and 1,300 of these learners are also on the iSpring Learn portal. I’ve been a nurse for 18 years, and I have 10 years of experience as a nurse anesthetist. I’ve always enjoyed teaching, and I wanted to take my experience in education to the next level. Back in 2012, I was approached by a colleague about starting a review course for the National Certification Exam. At first, we talked about hosting a conference to deliver classroom-style training, but we soon realized that we could better serve our population with an online offering. I didn’t have any tech experience — and neither did my partner — so we had to learn everything from the ground up. We spent a ton of time researching the software options available to us. We needed something intuitive with a high degree of reliability. At the time, xAPI was in its infancy, but we saw its potential and wanted a solution that would help us leverage this technology. Finally, we needed a company who could support us when we needed it. iSpring turned out to be the solution we were looking for. It’s very easy to use, so we could spend less time on technology-related issues and more time creating content. Аnd, iSpring customer support is second to none! You don’t need a tech background to be successful with online courses. With iSpring, you can concentrate on content for your business and not have to worry as much about the technical aspect of everything. As CRNAs ourselves, we’re able to create our own course content. When we started, we maintained our full-time clinical work, and we created our course content during evenings and weekends. Today, APEX consists of four full-time employees, and we also work with a small team of some really talented (and highly knowledgeable) subject-matter experts. We leverage the latest ideas in learning theory to help students and CRNAs master the objectives of each course. Anyone can create content, but the true magic happens when it’s executed in a way that facilitates understanding, retention, and recall. We’re always tweaking the content behind the scenes to provide the best possible experience for all of our customers. iSpring Suite is our primary tool for content creation. Believe it or not, we use everything in iSpring Suite: quizzes, audio and video narrations, interactions, etc. Much of our content is created on the PowerPoint slides themselves, so we make good use of the animation and interaction elements available to us. I perform the voice-over work in the studio in my office. The little things matter, and the level of professionalism is greatly enhanced by high-quality audio. We have an audio engineer who makes the magic happen. As we’ve moved to systematize the business, I’ve created several branded templates with the interactions that I use most often. This saves quite a bit of development time. We create a lot of content in iSpring QuizMaker, because our courses are grounded in question-based learning. To get the student to recall what he knows about a subject, we introduce each topic with a practice question. After answering the question, the student receives customized feedback based on his response. Finally, we follow with a high-yield review of the broader topic addressed by the question. This helps the student fill in any knowledge gaps related to the topic. After answering the question, the student receives customized feedback based on his response. Question feedback is followed by a high-yield review of the critical concepts that are tested by that question. Given the complexity of what we teach, it can take months or even years to develop content. Once we have the content written and mapped out, it’s pretty easy to import and style in QuizMaker. iSpring QuizMaker has robust capabilities with a wide array of question types. We can customize each quiz to stay on brand. Our content works seamlessly across platforms: computers, smartphones, and tablets. iSpring does the heavy lifting, so we don’t have to do a lot of fancy programming. The final product delivers a fantastic experience to the end user. Learning content can be played on desktops and mobile devices. iSpring QuizMaker offers 10-11 assessment type questions, as well as a variety of survey question types. You can also insert images, videos, and tables. It all looks very beautiful on the screen. We use a variety of media including tables, images, and videos to create an engaging learning experience. Another thing that works incredibly well is the flashcards for the students, where we have open-ended questions they can interact with. This is a great resource for learning, and it is very easy to use on a mobile device. All of our courses are available on our website at www.apexanesthesia.com. Learners receive access to the course content immediately after enrollment, and they get continued access and all updates during their subscription period. When we started APEX, we worked with a developer to build a custom website. Then, we linked our xAPI content with an LRS, which gave our users the opportunity to synchronize their results on all their devices. Later, we discovered iSpring Learn, an all-in-one solution to share learning content, sell courses, and track learners’ results. When you use iSpring Learn, you don’t need to manage a server or maintain WordPress or any other platform. Everything is prepackaged, so you simply upload the content and the system is ready to go. Now we have a hybrid model: most of the learning takes place on our website, and we use iSpring Learn to deliver content and administer exams to many universities across the country. iSpring has a single sign-on, which can streamline things for the user. You can upload all kinds of content to iSpring Learn: from courses created in iSpring Suite to MP4s, SWFs, PDFs, and the list goes on. Content management is very easy to do. Another cool thing I often use in iSpring Learn is learning paths. They make it easy for the learner to navigate the course content. I can go to the content repository, and everything is organized in the folders that I’ve created myself. Inviting students is very easy. You have several options: you can send mass email invitations to people, you can allow for self-registration, or you can import a list of users from a CSV file. Students can easily access all of the exams on the portal. After they complete their exams, they can see whether or not they’ve passed, they can view their scores, and they can see their progress. So, they can get a really nice snapshot of how they’re doing, in addition to having access to the content 24/7. The system also creates certificates of completion, which allows the students to prove that they achieved a passing grade. Finally, one of the really awesome things about iSpring Learn is that you only pay for active users. For example, if I have a thousand people registered in my course, but only 250 people have used it that month, I’m only charged for the active group. This gives me a lot of flexibility. We’ve developed five courses so far, and a few of these are pretty massive! We have several more under development, and we can’t wait to get these out into the world. Anesthesia is inherently a complex subject that’s grounded in a variety of other subjects including physiology, pathophysiology, pharmacology, chemistry, and physics. Our skill set is to be able to teach difficult concepts in an easy-to-understand way. It’s not uncommon for our students to tell us, “I wish they taught it like this in school.” This is a great indication that we’re serving the needs of our learners. We like to think of APEX as a trusted guide that helps students and CRNAs accomplish their professional goals. One of my favorite things about my job is learning how we impact our customers’ lives. Whether it’s the nurse anesthesia program that had a 100% first-time pass rate on the National Certification Exam or the student email detailing how we helped them achieve their goal of becoming a CRNA, its stories like these that compel us to do what we do. And then there’s the trickle-down effect. When a CRNA learns from us and then imports the teaching into his or her practice, countless patients benefit as a result. When you think of the thousands of CRNAs that we train and the thousands of patients that they treat, it’s pretty surreal to think about the role APEX plays in all of it.